Yeast- Or Algae-Derived Long-Chain Omega-3’s? (This is not an advertisement, just an example.) One of these pills delivers 250 mg EPA plus DHA. The suggested serving size is 2 softgels/daily. This 120 count, 2-month supply costs about $50. 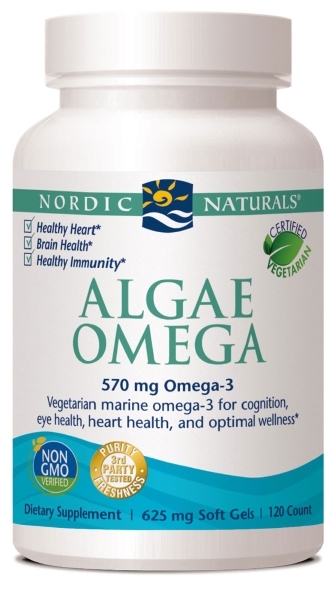 What do you think about a recommendation for “250 mg daily of pollutant free (yeast- or algae-derived) long-chain omega-3’s (EPA/DHA)” made at Dr. Greger’s site, and similar recs by other plant based diet docs? People can take B12 but lack intrinsic factor or have intestinal disease keeping them from absorbing it. People who eat a lot of animal food use their minerals like calcium to buffer the additional acid in their blood. People who smoke use their vitamin C to quench radicals in their lungs (RDA for vitamin C for smokers is higher than RDA for nonsmokers). People who eat a lot of omega-6 fatty acids can be low in long-chain omega-3s (EPA and DHA) because n-6 and n-3 compete for the same elongation enzymes. In all of those cases, you may be able to improve status without increasing intake. B12: improve intestinal health, calcium: eat less acid-producing food, vitamin C: stop smoking, omega-3: eat less omega-6. Here’s some support for that last point: Study: People Who Eat A Low-Fat Diet Have Higher Levels Of Omega-3s (EPA And DHA) In Their Blood. They found you could have higher levels of omega-3s in your blood, especially the longer chain EPA and DHA, not by eating them but by reducing your total fat intake. It does seem more intuitive that the more of a nutrient you eat, the higher your levels. And sure, it does work that way too. But that doesn’t account for losses, does it. I think it would be better to plug the holes than to keep pouring stuff in, especially when the stuff isn’t so pure. And in the case of omega-3, one hole, if you will, is too much omega-6. I don’t think an omega-3 supplement is necessary, nor safe (e.g. “This study confirms previous reports of increased prostate cancer risk among men with high blood concentrations of LCω-3PUFA. The consistency of these findings suggests that these fatty acids are involved in prostate tumorigenesis.”) I may change my mind after reading Dr. Greger’s next omega-3 installment. You can improve omega-3 status by eating less omega-6 (soy oil is a big n-6 contributor), or by adding a couple teaspoons of ground flax seeds daily. Related: Just saw this. I thought he did a good write-up: Do You Need to Supplement With EPA and DHA If You Follow a Whole Food Plant-Based Lifestyle? This entry was posted in Uncategorized on August 27, 2016 by Bix. Thanks, your write up and the linked article has steered me away from supplementing with n-3. Omega-3 Supplementation For Brain Health? Not Yet.